In Sheets, double-click an Rx. 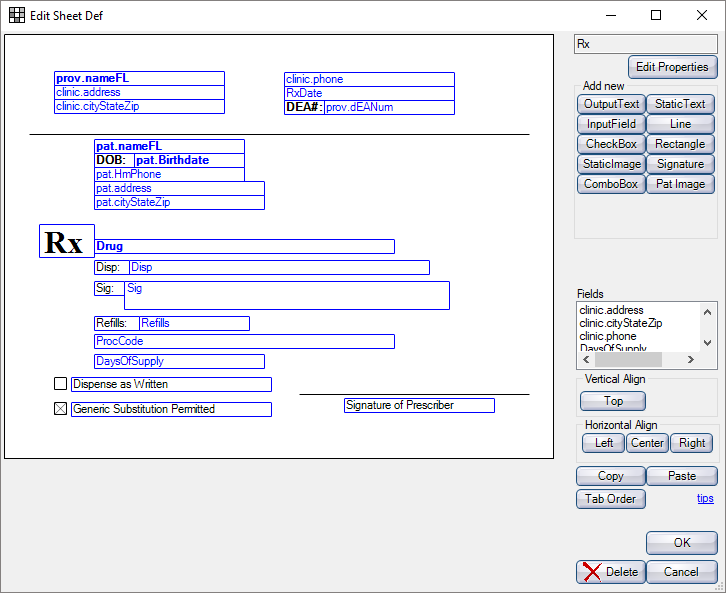 See Sheet Def Defaults to set the sheet to use when printing a single Rx / Prescription. Copy an Rx sheet or create a new one. Also see Add or Customize a Sheet. Highlight the internal Rx sheet and click Copy. Then double click the custom sheet. Click New and create a new custom sheet with an Rx type. Double click an existing custom sheet of Rx type to edit. Highlight an existing custom sheet of Rx type, then click Duplicate to copy it. Edit the sheet as needed. You should be able to handle any regulations imposed by your state. If for some reason you cannot, please contact us and we will add any additional options that might be needed. Days of Supply and ProcCode show by default. To populate data, enable Procedure code required on some prescriptions preference in Lists, Prescriptions. For other options, see Sheet Field Types. If the state requires two signature lines (e.g. use generic and as written), this sheet template may help: rxtwosigs.xml. Right click on the file, save it, then Import it. To customize a print layout for multiple prescriptions on one page, see Rx Multiple Layout.